"Wife/Husband," 2017, ink on paper, 12"x9"
"Son/Son," 2015, ink on paper, 9"x12"
"Son," 2016, ink on paper, 12"x9"
"Partner," 2015, ink on paper, 10"x8"
"Daughter," 2016, ink on paper, 14"x17"
Seize the Awkward. That’s the message on one of the postcards included in Lindsey Doolittle’s “Faces of Suicide” exhibit at the Leedy-Voulkos Art Center. It means talking to a friend about mental health issues, even if it feels uncomfortable. Personal politics and great art don’t often mix, but Lindsey Doolittle’s small portraits of anonymous individuals are as visually compelling as they are painfully relevant. 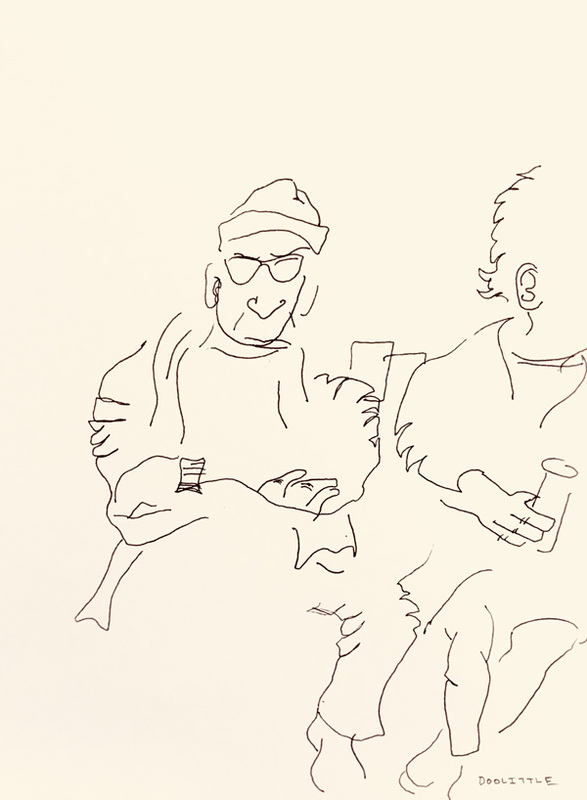 Doolittle’s 29 spare, black and white sketches are of fellow members of the support group SASS (Suicide Awareness Survivor Support), which she joined in 2015 after the suicide of her husband Sgt. Brett Doolittle of the Kansas City, Kansas police department. 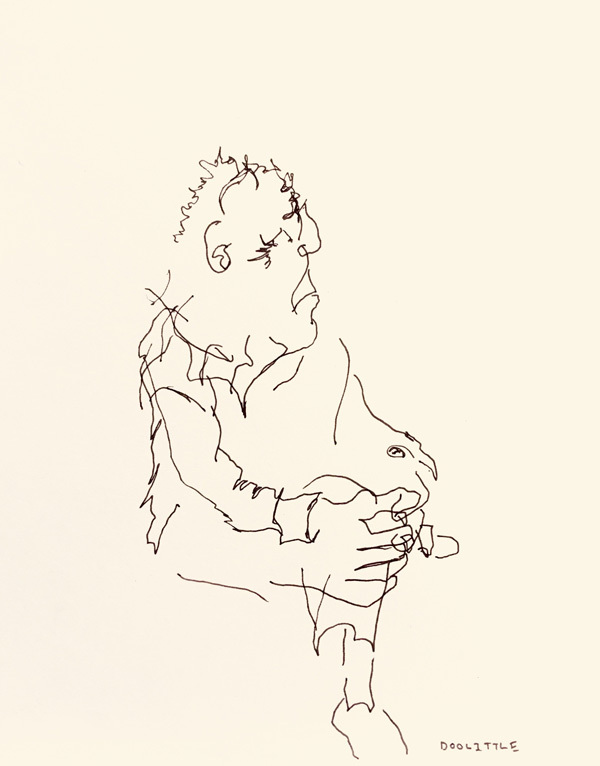 Doolittle uses blind contour drawing to create all her portraits, a practice in which outline drawings are made without looking at the paper. 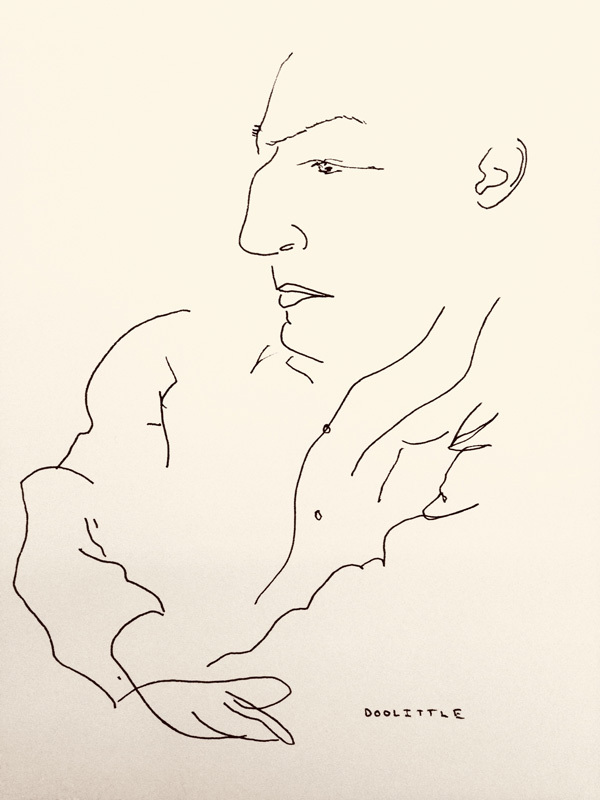 Doolittle’s likenesses are the essence of great contour drawing. Her depictions are spare, economical and punchy; her staccato-esque lines take the viewer on a visually bumpy but mesmerizing ride. She does not add color to any of her drawings. The results are incisive character studies, devoid of sentimentality and all the more powerful as a result. Each piece in this show is masterful, which is to say it accosts your eye and breaks your heart. Healing, coupled with activism, is an integral aspect of this exhibit, which is also a traveling show that includes a collection of suicide prevention material — brochures, bracelets, pins, and postcards — from suicide prevention groups around the globe. One entire wall is devoted to a growing assemblage of letters written by suicide loss survivors to their deceased loved ones. 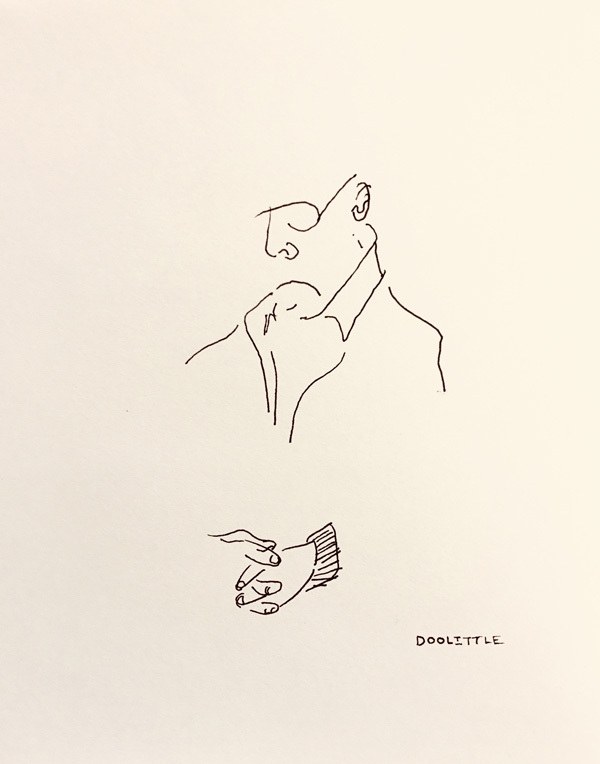 Doolittle is an art teacher, but she never intended to display her drawings. She began them to calm herself as she attended SASS group sessions. None of her subjects are identified, although some titles reflect the relationship the survivor had to the deceased. None are for sale. By combining her artistry with her activism, Doolittle has delivered a one-two punch to various communities here, and elsewhere, that has genuine impact. “Faces After Suicide” by Lindsey Doolittle continues at the Leedy-Voulkos Art Center, 2012 Baltimore, through Sept. 28. Hours are 11 a.m. to 5 p.m. Wednesday-Saturday and by appointment. For more information, 816.474.1919 or www.leedy-voulkos.com. To find out how to include a letter at the exhibit, go to “Letter Submission” at www.abovetherug.com. 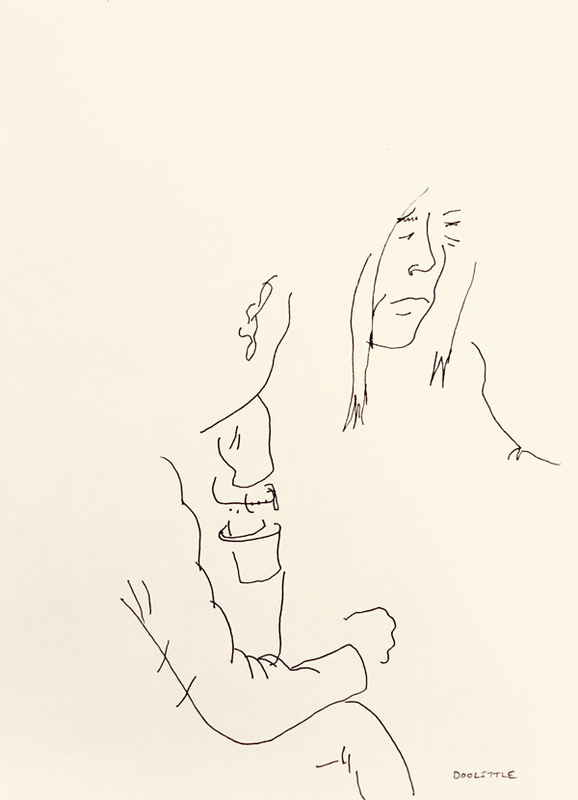 Lindsey Doolittle’s book “Goodnight Mr. Van Gogh,” illustrated by survivors who’ve lost a loved one, is for sale at the Art Center.